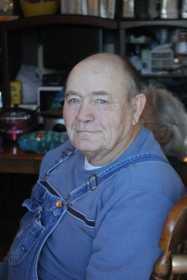 Roy Franklin Schlup, Sr., 74, of Schell City, Mo., passed away at his home Sunday, Aug. 12, 2018. He was born Sept. 26, 1943, in Kansas City, Mo., to Jesse and Bessie (Sims) Schlup. Roy served in the U.S. Army from November of 1962 to December of 1964, serving in Germany and onboard the U.S.S. Missouri. He then worked for the Ford Motor Company for eighteen years, retiring in 1984. Roy loved to hunt and fish. He also loved his grandkids and was a wonderful Grandpa. Preceding Roy in death were his parents; step-father, Edgar Allen Poe; siblings, Tom Schlup, Bill Schlup, Louise Fredli, Jimmy Schlup, and Jessie; and grandson, Ryan Schlup. Survivors include his wife, Cathy; siblings, Bonnie Stone, Barbara Smith, Thelma Plain, and Larry Poe; children, Lisa and Kevin Wills, Janice and Ed Nelson, Frank and Karen Schlup, Brenda Hutchinson, Rachel and Tim Hartline, Denise Schlup, and Summer Adair; 15 grandchildren; 13 great-grandchildren; numerous nieces and nephews; in-laws and outlaws; and innumerable friends. Funeral services for Roy Schlup, Sr. will be held at 2 p.m., Wednesday, Aug. 15, at the Baptist Church of Schell City with Brother Doug Reynolds officiating. The family will receive friends from 1 p.m. until service time. Interment will follow at Greenlawn Cemetery in Schell City under the direction of Bland-Hackleman Funeral Home. Pallbearers will be James “Jim” Hume, Ethan Haddix, Brian Schlup, Austin Schlup, Matthew Rigg, and Bryan Hogan. Online condolences may be left on the funeral home’s website at www.blandhackleman.com.